The Greater Good | American University Washington D.C. Image courtesy of the Harry S. Truman Scholarship Foundation. 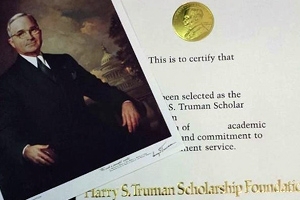 The Harry S. Truman Scholarship Foundation recently announced its scholars for 2014, and two American University students received this distinguished honor. The Truman Foundation selected 59 scholars from 52 colleges and universities. AU is one of only five institutions with multiple scholars selected, and the university is among only five institutions that had four Truman finalists. Truman Scholars are given internship opportunities, receive up to $30,000 in aid towards graduate school, and will attend a special leadership program in late May. Students are chosen based on academic success and commitment to public service leadership. The Truman Foundation defines public service broadly to include nonprofit advocacy work and public school teaching. Previous Truman Scholars include former Homeland Security Secretary Janet Napolitano, National Security Advisor Susan Rice, and former White House aide and current ABC News anchor George Stephanopoulos. An Honors student, Brazill is a junior international studies major, with concentrations in peace and conflict resolution and Sub-Saharan Africa. She’s had internships in the Bureau of African Affairs at the State Department and the nongovernmental organization Search for Common Ground. Paula Warrick, director of AU’s Office of Merit Awards, lauds Brazill’s volunteer work at the United States Holocaust Memorial Museum. “She’s a young volunteer, and a lot of the people there are Holocaust survivors. She wrote very movingly about that in her Truman application. And about how that experience became a source of reflection that informs her other scholarship,” says Warrick, also the Truman scholarship faculty representative. Rodriguez was born and raised on the Yakama Nation reservation in Washington State. He’s a nontraditional student, having worked full-time before coming to AU. Soon after high school, Rodriguez became a volunteer firefighter on the reservation in the town of Wapato. He did two stints with the Yakama Nation police department, which included a heavy focus on community policing. “That was trying to change the philosophy ofpolicing to be proactive, to try to address issues such as teen suicide, domestic violence, and mental health,” he explains. “What is amazing about him was that he already was a public servant by the time he applied for the scholarship,” Warrick says. “As a tribal police officer, he’s been challenged with having to deal with suicides and with spousal abuse every day. So this has strengthened his commitment to make a difference in Indian country,” adds Joan Echols, associate director in the Office of Merit Awards. Brunette hails from Seattle, Washington. She’s an Honors student and graduating senior from the School of International Service’s Global Scholars Program, where she focused on international development. At AU, Brunette has been active in environmental causes. Through her involvement with AU Eco-Sense, she’s been pushing for the elimination of fossil fuel-producing companies from the university endowment. For these efforts, Brunette won one of two University Awards for Outstanding Service to the University Community. Brunette has been known to carry around a notebook everywhere she goes on campus. “I had been going to so many different meetings, and talking to so many different people, that it was just easier to keep a notebook. So I could refer back to my notes all in one place,” she says. Last summer, she lived in Bogotá, Colombia, and she’ll be returning there after graduation to get more international experience, improve her Spanish skills, and work in urban development and sustainability. Rivera-Martínez was born in Massachusetts but grew up in Puerto Rico. His father was formerly an engineering professor, and his mother is still a teacher. Rivera-Martínez has a passion for poverty reduction, and he’s done humanitarian work in Argentina, Dominican Republic, and Paraguay. On the AU campus, he’s in the Honors Program and he previously served as president of Model United Nations. He’s a graduating senior with a double major in international studies and economics and a minor in philosophy. He’s currently applying for jobs and looking at fellowship opportunities. Some political pundits have bemoaned the lack of faith in government and public institutions. A September 2013 Gallup poll showed that Americans’ confidence in the federal government’s ability to handle both domestic and international problems has plummeted to an all-time low. A 2013 Public Policy Polling report famously found that Congress was less popular than cockroaches. Yet many AU students continue to believe in public service, with a refreshing desire to give back to their communities. The Truman applicants and other campus students are already pondering their own innovative solutions to decades-old social ills. “I think we have a lot of shrill commentary in our public discourse about public servants and about government waste. And what is special about AU is that it has trained our students to be thoughtful critics of their government,” Warrick observes. Brunette believes greater change can occur through grassroots pressure and a strong civil society. “I don’t see that the problems we face in the world are going to be addressed by kind of ‘business as usual’ and only by the private sector,” she says.